Great colors, music, humor, and energy, this movie knows no bounds, with its story of multiple Spidermen from all different dimensions. Spiderman: Into the Spiderverse pretty much does the impossible. It finds a new angle to tell the story of the same superhero we’ve seen done again and again. And it does this by surrounding him with all new characters, giving us an elaborate story that brings in different Spidermen from all different dimensions, and even inventing a new kind of animation. This thing is creative and fun in all the right ways. Spider-man: Into the Spiderverse is a crazy creative animated movie. And that’s a very good thing. Here’s a movie that realizes we’ve had a ton of incarnations of Spider-Man movies at this point, (just like Batman,) and like The Lego Batman movie, this one has fun spoofing all of it. But that movie just made fun of relationships (Batman and Robin, Batman and the Joker.) This one goes so much further. 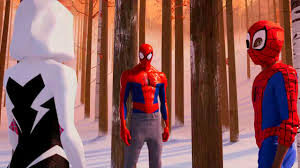 Into Thr Spiderverse actually features a new kind of animation that was invented just for this movie. And it also features all different Spidermrn from all different universes and dimensions. To call this movie ambitious is an understatement. To accomplish this goal, the movie goes all out, getting creative and original in as many ways as it can. For starters, for the first time in a Spider-man movie, the protagonist is not Peter Parker. 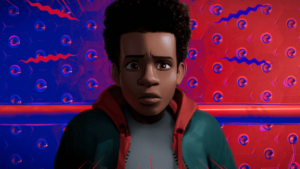 It’s Miles Morales, an African American / Latino kid from Brooklyn. There’s a comic book version and series of the Morales Spider-man, but never before have we seen this character on film. And he’s a lot of fun. Doing this let’s us see an origin story that’s not the same old and tired origin story we always get (the Uncle Ben, “with great power comes great responsibilty story.) For another, it gives us a whole new set of characters as the family members surrounding our protagonist. We’re talking about a policeman father, a nurse mother, and an Uncle who has his own thing going on. But this movie covers all bases, including the Uncle Ben idea by explaining that in every incarnation of Spider-Man, (including this one,) the protagonist has an uncle or someone close to him / her pass away. Regarding the new style of animation, this is a technique that makes the images look a little bit like comic books with its dotted backgrounds and sketching. There’s also a movement of the characters that feels like nothing we’ve seen before as they more or less glide across the screen. This movement is especially noticeable in the early scenes with Morales at home, moving through his kitchen, and also in the halls of his high school. After that, we kind of get used to it, and it becomes less apparent. But the movie also gives us animated panels from time to time, dividing the screeen into different boxes to emulate comic books. And it even uses words for sounds in the background, like when Spidermsn falls off the side of a building and the words follow him down. For the story, we’ve got the tale of a machine that crosses dimensions and spans time. It’s the reason why we are able to get so many different versions of Spider-man all working together in one film. The machine has been financed by The Kingpin, who is trying to bring his wife, Vanessa, back from the dead. And one thing cool about this is that for anyone who watches the Daredevil Netflix show (the best and most popular of the Marvel Netflix shows,) is that they are very familiar with both the Kingpin and Vanessa. Kingpin has been the main villain for all three seasons. And this Spider-man movie knows it. It is very aware of pop culture, which is why, for example, one of the Spider-Man suits in the movie is from right out of that PS4 game. The story of this machine and the dimensions that bring about a bunch of Spidermen first comes about in a world where there already is one Spider-Man. He’s voiced by Chris Pine, and Morales runs into him while exploring an underground tunnel connected to the sewer system. This Chris Pine Spider-Man is Peter Parker, and he actually narrates the start of the movie telling us how the world has become Spider-man crazy with his name and face slapped on everything from cereals to popsicles. He’s even got a Christmas album of Spider-Man singing the hits. And when Morales comes across the Pine version, he actually witnesses Spider-Man die in battle against the Green Goblin and the Kingpin. If only this character looked a little more Green Goblin-like. Speaking of that, the villains are pretty much the only weak part about this movie. Not that they are terrible, or anything, but when you think about, there are only two superheroes out there with incredible rogues galleries (villains.) Spider-Man and Batman. With The Lego Batman Movie, they really did give us every Batman villain, thrown into the mix of a story. Here, we only get a small handful of Spider-man villains. There’s the Kingpin and The Scorpion (although this creature who they are calling the Scorpion looks more like a combination of The Rock in The Scorpion King.) There’s a female Doctor Octopus character, named Liv Octavius, and there’s Tombstone. That’s it. Where is the Sinister Six? Where are the villains that this movie clearly had access to, but decided not to use at all? If this were a live action movie, the amount of villains would have been find, but for an animated film, this one could have done better. Perhaps it’s that this movie really does want to be so different that it tries to not go over any of the same material we’ve seen before, (other than Kingpin.) That’s why we get The Prowler as a major character, a villain / vigilante who has not been featured in any Spider-Man movies yet, but who is closely related to the Miles Morales storyline. And what this movie lacks in villains, it certainly makes up for in heroes. Not other Marvel heroes, Avengers style, or anything, but instead, different versions of Spider-Man. After Peter Parker dies, we meet another Peter Parker, (this one voiced by Jake Johnson, from TVs The New Girl show.) And then we meet a ton of other incarnations as well. Spider-Man: Into The Spiderverse is a movie that takes the same character we are incredibly familiar with and gives us a totally fresh take on his story. It’s so different that it’s not even the same person under the mask, and that’s very much the point. The idea here is that anyone can be Spider-Man, because Spider-Man isn’t a person, it’s an idea. We’ve heard that kind of talk before, (it reminds me of V For Vendetta,) but it never makes as much sense as when you see it up close, with multiple Spider-Men all occupying the same space and time. And aside from giving us this creative approach, the movie does it with brilliant visuals, including eye-popping colors and some very exciting action. And then there’s the humor. Fast-moving, witty, and always a step ahead of the audience. All of it works. The villains could have been better, but other than that, this movie is pretty flawless.